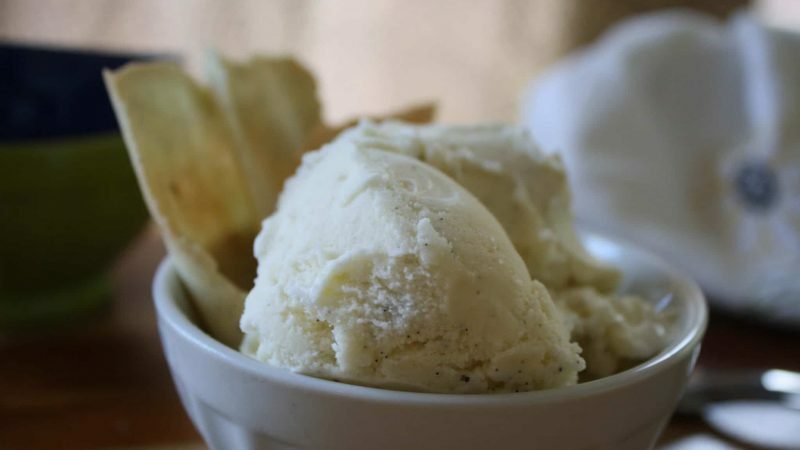 Our homemade vanilla ice cream recipe is to melt for! It’s the perfect thick yet creamy texture topped off by a rush of sweetness from our Rodelle Vanilla Beans. We used frozen bowl type ice cream makers. Both the electric and hand crank took approx. 20 minutes to achieve desired results. Beat eggs and milk together in a large saucepan. Add the sugar. Cook over low heat, stirring constantly until thickened (approx. 10 minutes). Mixture should smoothly coat the spoon. Cool in an ice bath for 15 minutes. Add the cream and vanilla and return to the ice bath for an additional hour (or refrigerate overnight and make the ice cream the following day, preferred method). Add the mixture to the bowl of the ice cream maker and mix until thick and creamy. Transfer to an airtight container and freeze for about 2 hours. Remove from freezer about 15 minutes prior to serving. In a bowl, whisk together the flour, sugar, and salt. Whisk in the egg whites, butter, and Rodelle Vanilla Bean until well combined. Let the batter sit at room temperature for 45 minutes. Drop rounded tablespoons of batter about 6 inches apart onto the baking sheet. Spread the batter with an offset spatula or the back of a spoon into 6-inch rounds. Bake in the middle of the oven until golden and lightly brown around the edges (approx. 6 to 8 minutes). To shape, roll a piece of parchment paper or copy paper into a cone shape. Gently loosen a cookie from the baking sheet with the offset spatula, then turn it over so the smooth side is facing up. Roll the cookie into a cone and insert the cone shape paper into the cone. Hold the bottom of the cone together for several second until the cookie holds it shape. Carefully slip the cone into a Champagne flute and let it cool completely. Shape the remaining cookies. If the cookies become too brittle to roll, return the baking sheet to the oven for a few seconds to soften. Make and shape more cookies with the remaining batter. Drop a tsp of batter onto the baking sheet. Shape the cookies into triangles and bake as directed. Remove from the cookie sheet and cool on rack. Scoop ice cream into a bowl and pierce the top of the ice cream with the long point of the cookie triangle. If you break the cone, use the pieces as a garnish when serving the ice cream in a bowl.